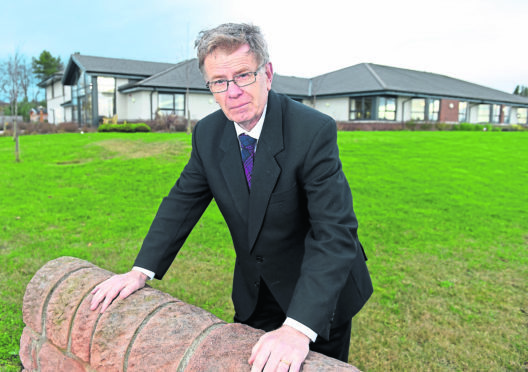 Highland Councillor Alasdair Rhind outside the Innis Mhor care home in Tain. Care inspectors have demanded changes to the way a Ross-shire care home is run by the end of the year, after recording a catalogue of complaints about the 40-bed facility during an unannounced visit. Innis Mhor Care Home in Tain was roundly criticised after the inspection, receiving weak or adequate scores across the board – including being told to make significant changes to the way it deals with its residents and their wellbeing, the way it handles money, keeps medication and talks about patients. The Care Inspectorate found that residents who needed to be moved to manage bed sores, as part of their care, were not having their position changed – a lack of staff was having an impact on how care was being delivered. The report also told how staff were unaware they were using disrespectful language about residents, only one person was dealing with residents’ money, information about activities on notice boards were out of date and some residents were receiving inappropriate care which had a potential to affect their health and wellbeing. He said: “The level of care at Innis Mhor is excellent and I personally would have no hesitation in putting my own mother into their care. “Comments made by some staff were completely inappropriate but in context, were not said in front of residents but in private conversations between themselves in the staff room. He said money was now checked by two members of staff, a new routine was in place for medications where pain relief would be monitored and recorded. Hugh Skinner, whose 101-year-old mum lives in the home, said: “There was a change of management at the care home and things have improved. Tain councillor Alasdair Rhind said: “I am very disappointed to hear about Innis Mhor getting a poor report. “The standard of care is hugely important, and simply has to be 100 per cent.